At Carrs Lane, we do not believe in ‘one-size-fits-all’ Christian worship. Instead, we offer a range of opportunities to share in prayer and worship – different styles, different times, different days. In our more formal services we draw on the traditions of the United Reformed Church and Methodist Church. All these acts of worship have one thing at heart, however: an honest attempt to understand what it means to respond to Jesus’ command to, ‘Follow me’. On a Sunday, a good number of people gather to share in morning worship at 10.30am. This service is often fairly traditional in format (but not over-formal), with challenging, relevant teaching and a mixture of styles of music. This lasts for about an hour and is followed by refreshments. The theme of the service is always made clear at the beginning; it will often be based on the lectionary readings, or arise out of a particular series of themed services. Whilst the tone is usually calm and ordered, ample opportunity is provided for full congregational involvement and participation. 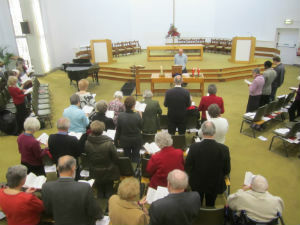 The quality of teaching is important and the role of music is taken seriously: congregational singing is vigorous – the books in most regular use are the Methodist ‘Singing the Faith’, the URC ‘Rejoice and Sing’, and ‘Common Ground’ – and the music is enhanced variously by the choir and the singing group. Whilst this service is recognisably traditional in format, great care is taken to ensure that it is accessible to visitors and that all feel welcomed and valued. Communion is usually celebrated on the first Sunday of each month. A creche for young children is offered except on the fourth Sunday in each month, when worship is informal and does not include a sermon.